Trooper is available for adoption! Trooper came to us from an Anderson, IN shelter, where he had arrived as part of an eviction/abandonment situation. Little Trooper is super cute and shiny. He is a friendly little guy and we are glad to have him join us! Poor Trooper was found to have some dental disease while the vet was performing his neuter. Later Trooper had dental surgery; we think his several missing teeth may be a congenital condition. We let Trooper go several months, where he was doing just fine, and had another dental adjustment so we could advise an adopter of his future medical needs. He recovered well; Trooper is doing well and eating like it's not bothering him! 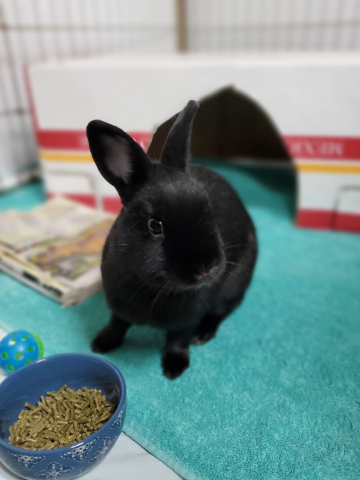 Trooper will need an adopter who is willing to stay on top of his dental needs with a very experienced rabbit vet for future routine dental examinations, but for now, he is stable. He is a gentle bunny that loves to snuggle with his foster Dad. Are you Trooper’s special adopter?